Schellers bike shop Clarksville, IN brings you a series of biking safety posts from the excellent website Bicyclesafe.com. This is the most common way to get hit (or almost get hit). 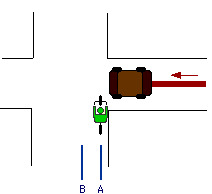 A car is pulling out of a side street, parking lot, or driveway on the right. Notice that there are actually two possible kinds of collisions here: Either you're in front of the car and the car hits you, or the car pulls out in front of you and you slam into it. 1. Get a headlight, for maximum visibility. 2. Wave. Waving is sometimes easier for a car to see than an oncoming bike, so if you need to, grab the driver's attention this way. 4. Ride further left. While many cyclists ride to the right because it feels safer, riding to the right puts you in the danger zone for a number of the most common accidents.